For those of you outside of the United States, we call gasoline “gas.” Not petrol, not benzene - gas. It doesn’t make much sense since it’s a liquid and all, but we Americans aren’t known for making much sense. 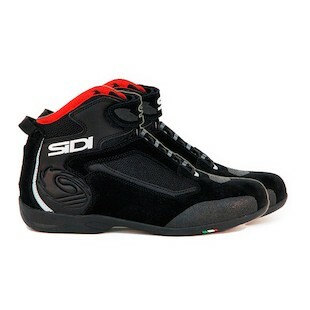 Apparently SIDI has caught on to this exceptional quality and has release a new technical sneaker. The name may be unimaginative, but the boot surely isn’t! Marketed as an everyday riding shoe, the Gas offers decent moto protection in a package that looks at home both on and off the bike. The suede and leather upper gives a touch of style to a brand that usually focuses on utility and protection. We think it’s a nice change. The shoe’s low collar offers a freedom of movement essential to control and comfort while riding, though it doesn’t offer much ankle support as a result. However, the Sidi Gas isn’t really meant to be a technical moto boot. It’s more of a fair-weather sneaker; more protection than a pair of street shoes, less protection than a proper riding boot. Comfort is king - mesh inserts on the exterior along with a mesh lining inside make the Gas great for warm weather. A velcro closure makes getting the boot on and off a snap, and the speed lacing system makes for a snug fit every time. The rubber shift pads mean good control while the rubber sole means stable footing. With that said, the sole itself isn’t very stiff - Anthony rates it a 5 on his stiffness scale (patent pending). Great for walking, not great for crashing. If you’re a city commuter or enjoy leisurely cruises - you’ll eat these up. If the Gas is a little too light for you, there is another option. Before you go diesel, check out the SIDI Mythos Boots (or Shoes). It’s like the big brother that the Gas always wanted. It’s still a city shoe, but with some key features that give it some backbone. First and foremost the Mythos sports a full Gore-Tex membrane. Your feet will be dry. Your feet will breathe. It’ll be great, trust me. It retains a similar chassis, but with a slew of upgrades that it doesn’t mind bragging about. Protection is beefier in the way of malleolus sliders, a stiffer sole, and a slightly higher collar. The internal toe, ankle, and heel support is certainly noteworthy, but still won’t compare to a proper riding boot. The black suede and nylon upper is similar to that of the Gas, but in a package that looks a bit more rugged. And in case you don’t like crashing into SUVs, the Mythos comes complete with a set of subtle yet effective reflective panels. Finally, a set of speed laces and a velcro cover tie everything together. Sorry, I had to. While SIDI didn’t throw us any curveballs this year, these two additions to the casual riding line are certainly welcome. Not all of us enjoy looking like Power Rangers on first dates. For the rider with discerning taste: SIDI Mythos, SIDI Gas.